Unsuspecting eyes might mistake Lidice, a pleasant strip of countryside just outside of Prague, for an oddly situated national park. From the viewing platform on the crest of its northern slope a few nondescript public artworks - grey statues ringed with stone met by a few winding paths - can be made out at the bottom of the valley's shallow basin. A bright spring day has brought people from the neighbouring villages out to play frisbee and tussle with their dogs on the grass. If people remember what this place is famous for it goes unspoken. On the night of 10th June 1942 German soldiers arrived in the then-village to destroy it. They gathered the men together at Horak's Barn and proceeded systematically to shoot them. Nine other men, who were not from Lidice but whose bad luck it was to be stranded after dark in the village, were met with a brief reprieve. The local mayor, tasked with pointing out the men to the SS troops, let it be known they were not locals. They would be taken to Prague and later shot anyway. As soon as his work was done the mayor was also shot. The women were taken to Ravensbruck; most of the children were sent to the extermination camp at Chelmno, a decision made personally by Adolf Eichman. The buildings themselves were not only ruined but literally pulled from the ground. Nothing was to remain. In the middle of Lidice's bare northern slope stands a memorial - its text in English, Czech and German - to the children. On the day of our visit a few flowers set around it are tugged lightly by a fresh spring breeze. Second-hand toys addressed from England sit looking up at the huddled statues. The eyes of the children gaze past us in either fear or reproach. Almost immediately after its destruction, Lidice became a cause celebre. A famous campaign in Stoke-on-Trent galantly, if naively, pledged to rebuild the village entirely. Streets, towns and factories around the non-fascist world were renamed in tribute to it. The reason for this propaganda victory - considering the relative quiet surrounding other Nazi crimes at this point in the war - was its direct relation to the successful assassination of Rienhard Heydreich, Reichsprotektor of Bohemia and Moravia, in Prague just days before. 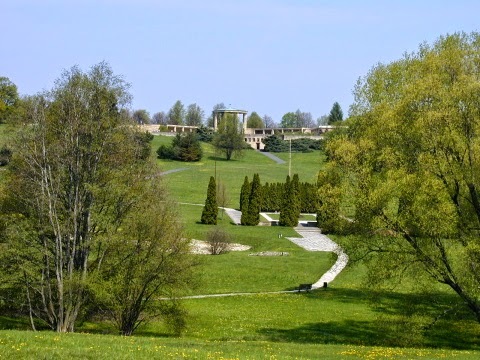 Though the two assassins bore no connection to Lidice, the occupying Nazi regime, in a blind fury coaxed on by Hitler's extraordinary viciousness, decided vengeance was necessary no matter the victims. This was hardly an isolated conclusion in Nazi history (another being the desperate, orgiastic destruction of Warsaw following the 1944 Uprising), but it lit a very specific torch. The Czechoslovak Government-in-exile, still headed by the frenetic plotter and pre-war President Edvard Beneš, had been behind the startling, courageous murder of Heydrich by two Czechoslovak agents. Flown over from London, and parachuting into the Bohemian countryside, Jan Kubiš and Josef Gabčík, later joined by Jozef Valčík, had studied the movements of Heydrich for months before confronting his unprotected limo on a bend in a road in the Libeň district of Prague. It was Kubiš who hurled a bomb at the Blond Beast, already on his feet and aiming at Gabčík, whose English Sten had jammed in his hands. The bomb destroyed the car and chaos quickly ensued. Heydrich looked at first to have survived. Then, after an operation removing his spleen, he was hit by a fever and shortly died. Apoplectic with rage - apparently at Heydrich's naivety as much as the gall of the Czechs - Hitler ordered revenge. Nazi investigators had soon 'uncovered' conspiratorial connections of the Resistance with Lidice. ...I asked Natacha about the Mercedes. She remembers it being black as well. With some cunning, Binet transforms his own neurosis into a narratorial device. By framing this obsessive concern with detail as a quest for truth, however, Binet dodges over-familiar postmodern reflexivity. Though the novel's pre-history, its method of production and its factual and textual shortcomings, are made explicit parts of the story, this is done for quite specific ends. Here truth is expressed in the form of scrupulous self-doubt and self-qualification. Motivating Binet's modesty is a thoroughly traditional, realist concern with justice and the passing of historical judgement. Memory - that notoriously unreliable relayer of facts - constantly interweaves itself with established truths, undermining them and also adapting them. Thus the author's own memories of Košice, the Slovakian town where he was once stationed as a French teacher to the Slovakian military, forms the basis of Jozef Gabčík's introduction to the story. As it turns out, Gabčík couldn't have been in Košice in 1938 because it had already been absorbed by Hungary. How and when did Gabčík and Kubiš first meet? Binet asks himself. "I'm not yet sure if I'm going to visualize (that is, 'invent') this meeting or not. If I do, it will be the clinching proof that fiction does not respect anything." Inevitably the novel ends with Gabčík and Kubiš meeting for the first time on a rusty boat on the moonlit Baltic ("like in a Nezval poem"). By assuming that all fictional intrusions on the facticity of history are artificial, Binet permits himself errors but only insofar as he tries to atone for them. The overriding goal is to overcome one's factual shortcomings by acknowledging them, and through such acknowledgement pass judgement on history itself. Thus by passing judgement, Binet can bring the protagonists of the past to justice. It is in the grey areas between which parts of history - Tukhachevsky's defeat outside Warsaw and Heydrich's role in his later downfall under Stalin; or the ghosts of the thousands of anonymous Czech resistance members who are "haunting" Binet with their demands for inclusion - truly form part of the story that Binet's concern with justice is most pronounced. Here the author explicitly takes on the role of a historical judge. Justice can be understood in two related senses: on the one hand there is just representation, or the writer's responsibility to do justice to her subject. On the other, there is the need to bring people to justice through the passing of certain normative moral judgements. Binet deals with the former on a regular, explicit basis (though in French justice would be substituted here for honneur). The book is punctuated at steady intervals with Binet's concerns about his own adequacy to the task of representation. More controversial for contemporary readers is the latter notion, conferred by the author and legitimate only if one accepts the right of the author to pose as transhistorical moral judge. Thus naming and describing the families who aided and sheltered Gabčík and Kubiš gives them fitting and appropriate representation and also confers justice on their sacrifices (they would mostly be murdered after Heydrich's assassination). However, it is only when the story comes to the climactic moment of Lidice's destruction that Binet allows his concern with judgement and justice to directly seize the narrative. As it happens Kubiš and Gabčík were still alive when the Nazis attacked Lidice. In fact, the assassins were hiding in a church on Karlovo náměstí (Charles Square) in Prague. Binet tells us that they knew about the Nazis' terrible retribution. The assassins sat with their comrades in a dank cellar and could do nothing but blame themselves for the town's destruction. No amount of pleading would convince them they were not personally responsible for the slaughter. Indeed they were sure that Heydrich's death had achieved nothing. "Perhaps I am writing this book," Binet says, "to make them understand that they are wrong." The obsessive compiling of facts is thus less significant for Binet than justifying the assassination of Heydrich. With Lidice, the scales have fallen from the whole world's eyes. In the days that follow, Hitler will understand. For once, it is not his SS who will be let loose, but an entity he does not fully understand: world opinion. Soviet newspapers declare that, from today, people will fight with the name of Lidice on their lips - and they're right... By reacting like the crude psychopath he is (rather than the head of state that he also is), Hitler will suffer his most devastating defeat in a domain he once mastered: by the end of the month the propaganda war will be irredeemably lost. That was no mean feat in a world where European ruling classes had long been anticipating, and indeed making, compromises with Nazism. World opinion aside, however, the actual job of bringing history's protagonists to justice is undertaken by the novel itself. More than a catalogue of events, HHhH attempts to formulate a moral judgement about Heydrich's assassination and the consequent destruction of Lidice; in other words, a kind of post-mortal redemption of the assassins ("I am writing this book to make them understand..."). Redemption through testimony; justice through perspicacious analysis of the facts; judgement through the exercise of universal moral norms. Binet himself admits he's a scion of Communist parents and a believer in French Enlightenment values. Whatever the self-conscious, postmodern form, Binet's ambition is to conjure a classically modern moral universe. There is something of Hegel's system of historical judgement to this ambition, the account of which given by Angelica Nuzzo in her book Memory, History, Justice in Hegel (2012) I am entirely indebted to. Nuzzo understands Hegel as having two separate philosophical models of historical process, the cumulative moment of which comes in the Philosophy of Right when Hegel describes how the ethical collective system of historical understanding is "overcome"(aufgehoben) by a properly universal system of judgement - in Hegel's own words, from "objective" to "absolute", in which Weltgeschichte (world history) emerges as Weltgericht (the world's tribunal). This being Hegel, there is no fine line drawn between the working of the logical system and the actual material stuff of history upon which the interpretive intellect acts (ideas being history's motive force). Nuzzo argues that historical judgement and justice are systemically possible because, in a Hegelian way, history is grounded in the logic of the dialectic. In sum, history is not just the accumulation of random effects, of chaos producing further unintended chaos, but proceeds via contradiction, and contains conflictual stages which are themselves subject to the logic Hegel describes as belonging to the dialectic. What does "absolute judgement" mean in the context of history? Nuzzo separates the dialectical logic of history proper, which achieves universality in art, philosophy and religious representation, from memory, which is always enclosed by particular ethical-collective "national" consciousness. In short, the collective memory of particular national identities - subject to the social structuring of meaning - is not adequate for historical judgement. One cannot adequately write history from a particular, narrow perspective, but must aim for this universal possibility of judgement and justice. To take a concrete example, no adherence to, say, Serbian or Croatian "national consciousness" will provide a convincingly full explanation of the Balkan Wars of the 1990s. That task falls to a kind of "absolute" philosophical judgement, though how one articulates such an unbiased judgement is hard to say. To return to Binet's HHhH, the textual demand for historical justice, or the demand for a kind of redemption of the novel's heroes and condemnation of its villains, stems from just such a Hegelian urge for universality - that is, an urge for a form of judgement not constrained by particular considerations but one able to take a "God's-eye-view" of historical events. Appropriately for a Hegelian project, however, historical judgement is interwoven throughout the novel with its opposite - the act or process of remembrance. Yet whereas the latter always takes place within a particular ideological configuration of social values, history proper exists in a space of "absolute" or universal judgement. This brings us to a crucial moral impasse pertaining to three events, all of which are covered in Binet's book. Can the decision to assassinate Heydrich be justified, despite the destruction of Lidice and the terror inflicted after it, because of its achievement in mobilizing anti-Nazi sentiment? And does it matter that the widest propaganda success in the wake of the assassination came about as a result of Lidice's destruction? Debates about the wisdom - on the part, especially, of Beneš, comfortably housed in Britain - of the assassination of Heydrich will continue interminably. Aside from Lidice and later the village of Ležáky (which was also utterly destroyed), an estimated 1,357 Czechs were executed and 3,188 arrests made as a result of the Heydrichiada (the month-long terror that resulted from Heydrich's assassination). It was, in the assessment of the historian Mary Heimann, "the most horrifying chapter of the war" for protectorate Czechs "since the brutal assault on the universities at its beginning. Worse, because it resulted in the liquidation of the underground resistance, it represented the loss of the bravest and most steadfast patriots, the flower of the Czech nation." Being the "politically savvy" operator he was, Beneš was able to capitalize on Heydrich's assassination for the benefit of his own propaganda effort. Even at the time UVOD had advised the government-in-exile that the assassination of a Czech quisling would have been a wiser tactical move. But Beneš plumped for a major German target, reprisals be damned. Binet, fulsome in his praise for the exiled Czechoslovak president, will have none of this. He sees the agents of Operation Anthropoid's sacrifice as among the greatest of the war. At stake here is more than just the tactical salience of Beneš's wartime decision-making or the heroism of Gabčík and Kubiš. The thousands of Czechs murdered in the aftermath of Operation Anthropoid beg a broader moral view. In a certain sense, and despite his streak of heroic romanticism, Binet provides it. Historical fiction of the type he creates in HHhH escapes morally unanswerable questions of historical cause and effect, and instead, by reflecting on the lives involved, produces a representation of the aspect of a priori goodness of certain historical acts without having to measure them against the unintended tragedies which followed from them. This, then, might be the the value behind Hegel's dialectical "absolute" judgement: not to paint the impossibly complex web of historical interconnection, of cause and effect, in its entirety; but rather to pronounce the universal, properly philosophical "goodness" of acts - say, the assassination of Heydrich or the sheltering and protection of his assassins by various families who put themselves at extreme risk and very often died because of it - irrespective of ethical or pragmatic considerations about such actions' effects. It would be impossible to inhabit a day-to-day world ordered only by such "absolute" philosophical considerations; art, however, can provide the space for such reflections.